Love how liberty work works! Well, what an interesting day! I invited two of the women who will be attending Teddie Ziegler’s clinic next month to get a refresher lesson on moving a horse away from them and setting boundaries around their personal space. Both of these skills are necessary to be safe around horses at liberty. These two women are very nice, easy-going, and fun to be around. 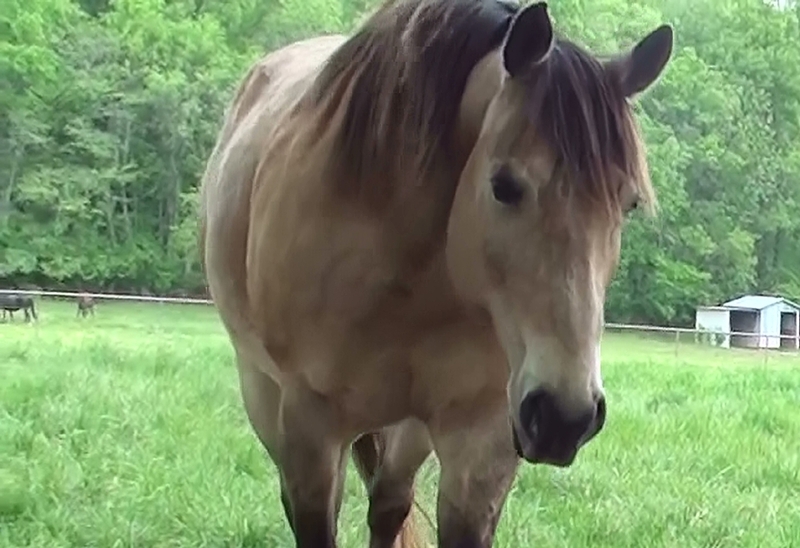 They both have good instincts around the horses—they move forward when a horse approaches, not back and away, and they seem to have good natural boundaries in spite of wanting to hug and love on the horses—which they did NOT do. When we first arrived, he didn’t want to be bothered with us, for whatever reason—he indicated that he preferred to be with his buddies, and pretended not to see us. So we stood around, halfway across the pasture, and talked among ourselves for a five or ten minutes, really and truly ignoring him. And what happened? His curiosity got the better of him, and he lumbered over to see what we were up to. We then spent a few minutes working with him, mostly having him back off and stop mugging my two friends for treats (which we didn’t have anyway). After a bit, because he was being a pest and wasn’t actually staying away when asked, I sent him off in no uncertain terms, and chased him to the point where he didn’t come back to us. Then we resumed talking among ourselves. After a while, we noticed him standing with his buddies, but facing us, head up, very interested in what we were up to. I signaled him to come over, and he did, slowly and attentively. About 15 feet away, I asked him to stop, and he did. There he stood, watching, until I invited him in. And he approached with a lot more respect than he had exhibited earlier. I was so pleased! So he showed us some of the wonders of liberty work—thing that make no sense at all to people who don’t really understand horses. Ignoring your horse makes him “easy to catch” (in fact, he “catches” himself) because he wants to be with you. And sending your horse away strongly makes him want even more to be with you, but at the same time makes him pay way more attention to how he approaches when you do ask him to come back, and to how he behaves when he gets there. Can’t wait for Teddie’s clinic!!! This entry was posted in Liberty Training and tagged Liberty training, Resnick.